A-HOTEL.com - Luxury and cheap accommodation in Katyn', Russia. Prices and hotel, apartment booking in Katyn' and surrounding. This indicative offer was derived from the most recently booked accommodation in Katyn' and sort by the price, from cheapest Katyn' accommodation to the most expensive hotels. To select accommodation by your preferences we recommend to choose from 1 accommodation offers in Katyn' in total. By entering the dates of your overnight stay in Katyn' and using the filter tools you can sort the best possible accommodation for you. The entered dates of your stay are crucial for the most accurate offer as it derives all the online information on pricing and availability of Katyn' accommodation. Then you can book the selected Katyn' lodging (hotels, apartments etc.) immediately. Palomnicheskaya Hotel is located in Katyn, on the premises of Katyn Church of Christ's Ascention. The property offers free parking. Situated in Arkhipovka, 30 km from Smolensk, Motel in Arkhipovka features a restaurant and free WiFi throughout the property. Guests can enjoy the on-site bar. Offering a sauna and a restaraunt, Tikhaya Zavod is located in Novye Bateki. The cottages feature a sofa, satellite TV, barbecue and seating area and terrace. Situated in Smolensk, 3.1 km from Smolensk Chamber Theatre, West Hotel offers a shared lounge and rooms with free WiFi access. 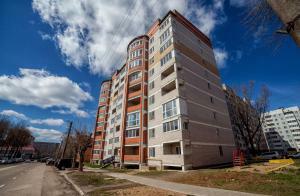 Featuring accommodation with a balcony, Уютные апартаменты в Ленинском районе is set in Smolensk. The property, housed in a building dating from 2017, is 3. Set in Smolensk, just 3.1 km from Smolensk Chamber Theatre, Apartments on Krasninskoye av. Located in Smolensk, Bania Hauz offers accommodation with private terraces. All rooms boast a flat-screen TV with satellite channels and a private bathroom. Located in Smolensk, Apartment on Krasninskoe Shosse offers a washing machine. The apartment comes with a flat-screen TV and a sofa. Set 2.2 km from Smolensk Puppet Theatre in Smolensk, Apartment on Nahimova 40 offers accommodation with a kitchen. Situated 1.9 km from Smolensk Chamber Theatre and 2. Set within 1.8 km of Smolensk Chamber Theatre and 2. Set 2 km from Smolensk Chamber Theatre in Smolensk, Kvartira v Tsentre Goroda offers accommodation with a kitchen. Free WiFi is available in this apartment, located 2. Situated 1.6 km from Smolensk Chamber Theatre and 2. Situated in Smolensk, Нахимова 23 provides accommodation with a balcony and free WiFi. The property is 1. Apartment on Ak. Petrova 16 in Smolensk provides accommodation with free WiFi, 1. Standard apartment on Akademika Petrova offers accommodation in Smolensk, 1.5 km from Smolensk Chamber Theatre and 2. Situated 50 metres from the Kasplya River Reservoir, Park Hotel Borvikha is located in the village of Pilichki, 40 km from Smolensk. It offers free WiFi in public areas and modern accommodation units with a flat-screen satellite TV and mosquito nets. Апартаменты ул. Николаева,85 is a property set in Smolensk near Readovsky Park. Set in Kovalevka in the Smolensk region, Apartment on Nikolaeva 87 features a balcony. This apartment offers accommodation with free WiFi. Located 1.4 km from Smolensk Chamber Theatre and 1.